The ManyMonths ECO Long/Short Sleeve Sleeping Bag with Extension is familiar from the ManyMonths beginnings and now comes with detachable sleeves and somewhat more length. This is a revolutionary non-padded sleeping bag in 100% the softest combed organic cotton interlock that truly grows with your child. First it is used without the extension part and closed with snaps in the hem. When your child grows you can snap on the extension part which makes the bag both longer and wider. After your child outgrows the extension, the garment becomes a sleep shirt. The snaps in the hem are made of durable snap tape, easy to open and close during night-time diaper changes. A generous cut allows plenty of leg room for your child to move about. Sleeping bags are recommended by midwives, because the baby will feel his/her legs and the warmth of his/her own skin and this gives a sense of security. The baby can moves his/her legs freely inside the bag and move around in the bed without kicking off the bedding or get it over his/her head. 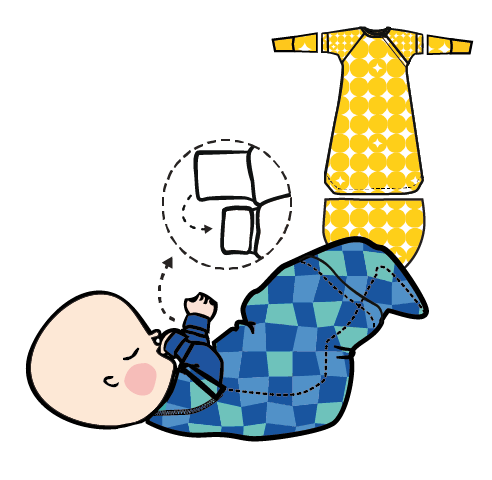 A sleeping bag also provides a safer sleeping environment, since feet won't get stuck between cot bars and it is more difficult for baby to climb out of the bed. A sleeping bag can also be a gentle solution to prevention of scratching eczema. TIP: Use the garment without the extension for diaper-free babies or during potty training. 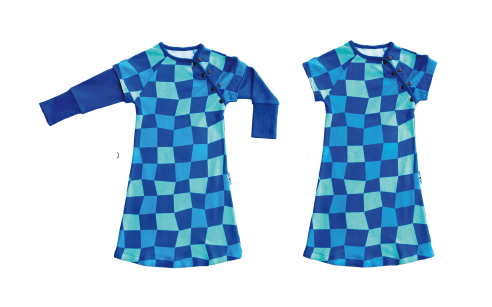 Comes in one size that fits at least 1,5 years, often even the double as a night shirt. Two rows of snaps in front for width adjustment, durable snap tape closure at the bottom, and long foldable sleeve ribs for size adjustment. This is a unique sleep garment with a ton of variability. Sweet dreams!